18-10-2018. Miguel Á. Martínez-del-Amor has been granted the NVIDIA Deep Learning Institute University Ambassadorship, and the instructor certification for the Fundamentals of Deep Learning for Computer Vision and Fundamentals of Accelerated Computing with C/C++training courses. 06-10-2018. According to BioSystems, the paper Efficient solutions to hard computational problems by P systems with symport/antiport rules and membrane division authored by B. Song, Mario J. Pérez-Jiménez and Linqiang Pan, appears on position 6 in a shortlist of the 25 most cited papers published in that journal since 2015. 04-08-2018. Mario J. Pérez-Jiménez is interviewed for the issue 31 of the Renfe magazine, on a section called "Visionaries". The topic of the interview is artificial intelligence, and how could it impact in our lifes. You can see it at the magazine website, on page 46 (in Spanish). 12-05-2018. The paper entitled Robot Path Planning using Rapidly-exploring Random Trees: A Membrane Computing Approach authored by Ignacio Perez-Hurtado, Mario J. Pérez Jiménez, Gexiang Zhang and David Orellana Martín, presented at ICCCC 2018, received the "Best Paper Award". 18-01-2018. According to Theoretical Computer Science, the paper Time-free solution to SAT problem using P systems with active membranes authored by T. Song. L.F. Macías-Ramos, L. Pan and M.J. Pérez-Jiménez, appears on position 2 in a shortlist of the 25 most cited papers published in that journal since 2013. 18-01-2018. According to International Journal of Foundations of Computer Science, the paper Spike Trains in Spiking Neural P systems authored by Gh. Paun, M.J. Pérez-Jiménez and Grz. Rozenberg, appears on position 5 in a shortlist of the 20 most cited papers published in that journal since its foundation. 14-12-2017 Mario J. Pérez-Jiménez is interviewed on the radio program "El Público", which can be listened in whole Andalusia. The topic of the interview is the work under development of the research group and a broad overview of the history of Natural Computing: Listen to the interview (in Spanish) in the postcasts of the program "El Público" of Canal Sur Radio, by clicking here (Click on "Play", go to minute 4:10, and when advertisements start, go to minute 12:10). 16-11-2017. Ph.D. Luis Valencia-Cabrera has been awarded with the "distinction doctorate award" (Premio Extraordinario de Doctorado) for the 2014/2015 academic year. He is receiving it on November 30, 2017. Congratulations! 30-11-2017. The award ceremony was again held in the Church of the Annunciation, which was the main seat of the University of Seville until 1956. In this way, the academic institution recognizes its most excellent doctors, who attend a university event for the first time, dressed in the academic costume. The toga, the muceta and the cap symbolize that they have reached the highest degree of training and full research capacity. Click here for the original news. The recording of the ceremony is below. 30-11-2017. The award ceremony takes place in "Iglesia de la Anunciación" (C/Laraña, 3*, Sevilla), on 30-11-2017 at 12:00. 30-10-2017. According to International Journal of Neural Systems, the paper An Extended Membrane System with Active Membranes to Solve Automatic Fuzzy Clustering Problems authored by Hong Peng, Jun Wang, Peng Shi, Mario J. Pérez-Jiménez and Agustín Riscos-Núñez, appears on position 17 in a shortlist of the 20 most cited papers published in that journal. 18-01-2017. According to International Journal of Neural Systems, the paper An optimization Spiking Neural P system for approximately solving combinatorial optimization problems authored by Gexiang Zhang, Haina Rong, Ferrante Neri and Mario J. Pérez-Jiménez, appears on position 4 in a shortlist of the 20 most cited papers published in that journal. It is worth pointing out that this article was published in 2014 and is the 4th most cited article published. International Journal of Neural Systems, published by World Scientific in Singapore, is indexed in Institute Scientific for Information (ISI) rank, with an impact factor of 6.085 in 2015. It is worth pointing out that these articles were published in 2008 and 2010, and are the 2nd and the 4th most cited articles published since 2007 and 2010, respectively. International Journal of Computers, Communications & Control, published by Agora University of Oradea in Romania, is indexed in Institute Scientific for Information (ISI) rank, with an impact factor of 0.627 in 2015. 30-10-2017. The paper Tissue P systems with cell division authored by Gheorghe Paun, Mario J. Pérez-Jimenez and Agustin Riscos-Núñez, appears also on position 2 of the top cited papers since the foundation of the journal (2006 - 2017), according to Thomson Routers. 15-12-2016. ABC de Sevilla: "Alphi, un robot humanoide visita el colegio". See the original news clicking here. 11-11-2014. Boletín Interno de Noticias de la Universidad de Sevilla: "Sesión informativa sobre la reciente mención de CUDA Research Center (CRC) a la Universidad de Sevilla". See the original news clicking here. 11-11-2014. Portal de comunicación de la Universidad de Sevilla: "Sesión informativa sobre la reciente mención de CUDA Research Center (CRC) a la Universidad de Sevilla". See the original news clicking here. 11-11-2014. IMUS: "NVIDIA CUDA Research Center: applications and opportunities". See the original news clicking here. 07-11-2014. Blog de la biblioteca de la ETSII: "Sesión informativa sobre la tecnología CUDA". See the original news clicking here. 05-11-2014. Boletín Interno de Noticias de la Universidad de Sevilla: "El catedrático Mario de Jesús Pérez inaugura el Programa de Doctorado de Ingeniería Informatica". See the original news clicking here. 15-10-2014. 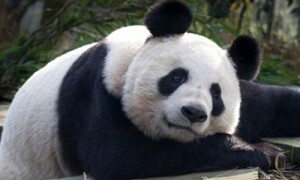 Boletín Interno de Noticias de la Universidad de Sevilla: "Expertos de la US presentan el primer modelo computacional del ecosistema de los pandas gigantes en cautividad en China". See the original news clicking here. 21-08-2014. Diario de Sevilla: "Investigadores de la Hispalense estudian los ecosistemas de los pandas gigantes". See the original news clicking here. 20-08-2014. ABC de Sevilla: "Ecosistemas creados desde Sevilla para los pandas gigantes". See the original news clicking here. 19-08-2014. ABC de Sevilla: "Computación «made in Sevilla» para ayudar a los osos panda chinos". See the original news clicking here . 19-08-2014. El Correo: "Los pandas gigantes chinos a estudio". See the original news clicking here . 19-08-2014. El Economista: "Expertos de la Universidad de Sevilla trabajan en la gestión de los ecosistemas de los pandas gigantes de China". See the original news clicking here . 19-08-2014. Communication channel of the University of Seville: "Expertos de la US trabajan en la gestión de los ecosistemas de los Pandas Gigantes de China". See the original news clicking here . 19-08-2014. Campus Vivo and Europa Press: "Expertos de la Universidad de Sevilla trabajan en la gestión de los ecosistemas de los pandas gigantes de China". See the original news clicking here . 19-08-2014. Sevilla Directo: "Expertos de la US trabajan en la gestión de los ecosistemas de los pandas gigantes de China". See the original news clicking here. 19-08-2014. El Correo: "Expertos de la US trabajan en la gestión de los ecosistemas de los Pandas Gigantes de China". See the original news clicking here . 19-08-2014. Andalucía de Hoy: "Expertos de la US trabajan en la gestión de los ecosistemas de los Pandas Gigantes de China". See the original news clicking here . 19-08-2014. Disfruta Sevilla: "Computación sevillana para los osos panda". See the original news clicking here . 30-08-2014. Listen to the interview (in Spanish) in the postcasts of the program "La calle del verano" of Canal Sur Radio, by clicking here (Click on "Escuchar", in "Playlist", select file 2, and go to minute 45:30). 08-08-2014. According to International Journal of Computers, Communications & Control, the paper Tissue P systems with cell division authored by Gh. Paun, M.J. Pérez-Jiménez and A. Riscos-Núñez appears on position 2 in a shortlist of the 5 most cited papers published in that journal since its creation in 2006. 05-07-2014. According to Journal of Logic and Algebraic Programming, the paper Simulating a P system based efficient solution to SAT by using GPUs authored by J.M. Cecilia, J.M. García, G.D. Guerrero, M.A. Martínez-del-Amor, I. Pérez-Hurtado and M.J. Pérez-Jiménez, from the University of Murcia and the University of Seville, respectively, appears on position 3 in a shortlist of the 25 most cited papers published in that journal since 2009. 29-05-2014. ABC de Sevilla published the awards ceremony, where Mario J. Pérez-Jiménez received the "Fame" prize (Premio Fama) 2014 in the field of "Engineering and Architecture". See the original news clicking here. 29-05-2014. El Mundo published the awards ceremony, where Mario J. Pérez-Jiménez received the "Fame" prize (Premio Fama) 2014 in the field of "Engineering and Architecture". See the original news clicking here. 29-05-2014. El Correo published the awards ceremony, where Mario J. Pérez-Jiménez received the "Fame" prize (Premio Fama) 2014 in the field of "Engineering and Architecture". See the original news clicking here. 29-05-2014. Diario de Sevilla published the awards ceremony, where Mario J. Pérez-Jiménez received the "Fame" prize (Premio Fama) 2014 in the field of "Engineering and Architecture". See the original news clicking here. 28-05-2014. Europa Press published the awards ceremony, where Mario J. Pérez-Jiménez received the "Fame" prize (Premio Fama) 2014 in the field of "Engineering and Architecture". See the original news clicking here. 28-05-2014. Communication channel of the University of Seville published the awards ceremony. See the original news clicking here . 24-03-2014. ABC de Sevilla published the interview to Mario J. Pérez-Jiménez, about the Research Group on Natural Computing of the University of Seville. See the original news here, and the scanned newspaper page here. 24-03-2014. Natura Hoy published the interview to Mario J. Pérez-Jiménez, about the Research Group on Natural Computing of the University of Seville. See the original news here. 24-03-2014. Vicerrectorado de Investigación of the Seville University published the interview to Mario J. Pérez-Jiménez, about the Research Group on Natural Computing of the University of Seville. See the original news here . 10-03-2014. The american company NVIDIA has granted a project presented by Miguel A. Martínez del Amor and Mario J. Pérez-Jiménez, members of the Research Group on Natural Computing of the University of Seville, given the "vision, quality, and impact of the research leveraging CUDA technology". See the bio of the CUDA research center here , and the blog entry with this announcement here . 20-11-2014. The CUDA Research Center of University of Seville is mentioned on the blog of Madridmasd, here . 19-03-2014. The CUDA Research Center of University of Seville appears on the news of the School of Informatics here . 19-03-2014. The CUDA Research Center of University of Seville appears on communications of the University of Seville here. 05-03-2014. According to Journal of Complexity, the paper Computational complexity of tissue-like P systems authored by Linqiang Pan from Huazhong University of Science and Technology (HUST) (Wuhan, China), and Mario J. Pérez-Jiménez, from University of Sevilla, appears on position 3 in a shortlist of the 25 most cited papers published in that journal since 2008. It is worth pointing out that this article was published in 2010 and is the 2nd most cited article published since 2010. Journal of Complexity, published by Academic Press In. Elsevier Science in USA, is indexed in Institute Scientific for Information (ISI) rank, with an impact factor of 1.217 in 2012. 12-11-2013. Prof. Mario J. Pérez-Jiménez gave an invited talk in the Giant Panda Breeding Center (Chengdu, China), entitled Application of Population Dynamics P systems to the study of real ecosystems. Click here for the original news. 11-11-2013. Prof. Mario J. Pérez-Jiménez gave an invited talk in the Huazhong University of Science & Technology (Wuhan, China), entitled Modelling Real-life Cellular Processes. Click here for the original news. 04-11-2013. Prof. Mario J. Pérez-Jiménez gave an invited talk in the Southwest Jiaotong University (Chengdu, China), entitled The P versus NP problem: unconventional insights from membrane computing. Click here for the original news. 16-10-2013. According to Biosystems, the paper Modelling gene expression control using P systems: The Lac Operon, a case study authored by Francisco J. Romero-Campero and Mario J. Pérez-Jiménez, from University of Sevilla, appeared on position 11 in a shortlist of the 25 most cited papers published in that journal since 2008. 28-01-2013. Agustín Riscos-Núñez is interviewed on Radio Alcosa. Click here to listen the interview (min 64:24 to 87:12, in spanish). 03-01-2013. 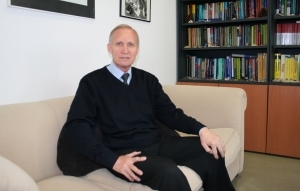 Gheorghe Paun appears on the list of Highly Cited Researchers. This Highly Cited Research resource captured the people behind the most influential publications in 21 broad subject categories in life sciences, medicine, physical sciences, engineering and social sciences based on citation metrics. Within their category, these individuals represent less than one-half of one percent of all publishing researchers-truly an extraordinary accomplishment. Click here for a link to the list. 11-12-2012. Gheorghe Paun is interviewed on Diario de Sevilla. Click here (page 2) for the original news. 11-09-2012. Mario J. Pérez-Jiménez will take office as a full member of the Academia Europaea next September 11th, on Communications of University of Seville. Click here for the original news. 04-09-2012. Mario J Pérez-Jiménez is paid homage in his hometown Bollullos Par del Condado (Huelva, Spain). He is interviewed on Condavisión. Click here for the original news. 07-07-2012. The "Campus Científico de Verano 2012", with the participation of the Research Group on Natural Compting (RGNC), appears on ABC de Sevilla. Click here for a link to the original news. 03-07-2012. 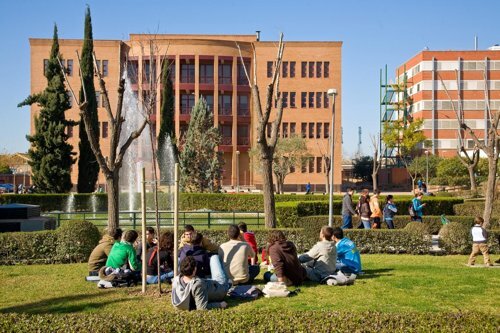 The "Campus Científico de Verano 2012", with the participation of the Research Group on Natural Compting (RGNC), appears on News of the ETSII. Click here for a link to the original news. 02-07-2012. The "Campus Científico de Verano 2012", with the participation of the Research Group on Natural Compting (RGNC), appears on Europa Press. Click here for a link to the original news. 02-07-2012. The "Campus Científico de Verano 2012", with the participation of the Research Group on Natural Computing (RGNC), appears on 20 minutos. Click here for a link to the original news. 31-01-2012. The Tenth Brainstorming Week on Membrane Computing (10BWMC), organised by the Research Group on Natural Computing (RGNC), appears on Diario de Sevilla. Click here for a link to the original news, and here for a copy of the page in the newspaper. Also click here for preliminary news. 27-01-2012. The Tenth Brainstorming Week on Membrane Computing (10BWMC), organised by the Research Group on Natural Computing (RGNC), appears on Communications of University of Seville. Click here for a link to the original news. 22-01-2012. Mario J Pérez-Jiménez is interviewed on ABC de Sevilla. Click here for the original news. 21-12-2011. The Research Group on Natural Computing on the special issue "Investigación de Excelencia para la Sociedad" of ABC de sevilla: a short explanation of the goals and main achievements of the group is written on page 15. 22-12-2011. Mario J. Pérez-Jiménez on Research Service of the University of Seville: Mario J Pérez-Jiménez is the first andalusian member of the Academia Europaea in the Informatics Section. Click here for the original news. 21-12-2011. Mario J. Pérez-Jiménez on Huelva Información: Mario J Pérez-Jiménez is the first andalusian member of the Academia Europaea in the Informatics Section. Click here for a original news scan. 20-12-2011. Mario J. Pérez-Jiménez on Communications of University of Seville: Mario J Pérez-Jiménez is the first andalusian member of the Academia Europaea in the Informatics Section. Click here for the original news. 19-12-2011. 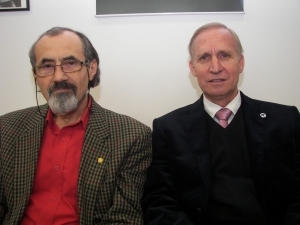 Mario J. Pérez-Jiménez on ABC de sevilla: Mario J. Pérez-Jiménez is the first andalusian member of the Academia Europaea in the Informatics Section. Click here for a link to the original news. 26-10-2011. Mario J. Pérez-Jiménez on Communications of University of Seville: Mario J Pérez-Jiménez is now a member of the Academia Europaea. Click here for the original news. 16-11-2011. The course "A formal framework for processes inspired by the functioning of living cells: Natural Computing approach", given by Grzegorz Rozenberg, and organised by the Research Group on Natural Computing (RGNC), appears on Communications of University of Seville. Click here to see the original news. 04-02-2011. Gheorghe Paun is interviewed on Servicio de Información y Noticias Científicas (Service of Information and Scientific News) (SINC). Click here for a link to the original news. 03-02-2011. Mario J. Pérez-Jiménez is interviewed on Diario de Sevilla. Click here for a link to the original news. 31-01-2011. The Ninth Brainstorming Week on Membrane Computing (9BWMC), organised by the Research Group on Natural Compting (RGNC), appears on El Economista. Click here for a link to the original news. 28-01-2011. The Ninth Brainstorming Week on Membrane Computing (9BWMC), organised by the Research Group on Natural Compting (RGNC), appears on Communications of University of Seville. Click here for a link to the original news. 28-01-2011. The Ninth Brainstorming Week on Membrane Computing (9BWMC), organised by the Research Group on Natural Compting (RGNC), appears on Andalucía Investiga. Click here for a link to the original news. 28-01-2011. The Ninth Brainstorming Week on Membrane Computing (9BWMC), organised by the Research Group on Natural Compting (RGNC), appears on El Correo de Andalucía. Click here for a link to the original news. 01-02-2010. 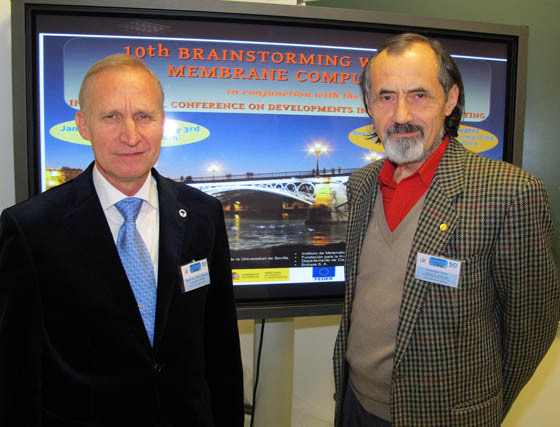 The Eighth Brainstorming Week on Membrane Computing (8BWMC), organised by the Research Group on Natural Compting (RGNC), appears on Europa Press. Click here for a link to the original news. 02-02-2010. The Eight Brainstorming Week on Membrane Computing (8BWMC), organised by the Research Group on Natural Compting (RGNC), appears on the Spanish journal Diario de Sevilla. Click here for a link to the original news. 25-08-2009. Gheorghe Păun organises, along with several other experts on membrane computing, the Tenth Workshop on Membrane Computing (10WMC). The event is covered by the Romanian journal Arges Expres. Click here for a link to the original news. 13-06-2008. The Research Group on Natural Computing on Andalucía Investiga: researchers from the University of Seville are applying Natural Computing techniques to study cancerous tumors. Click here for a link to the original news. 14-03-2008. Biocomputing, a spin-off enterprise from the University of Sevilla, appears on the official webpage of Junta de Andalucía. This enterprise is led by Mario de Jesús Pérez Jiménez. Click here for a link to the original news. 05-02-2008. The Sixth Brainstorming Week on Membrane Computing (6BWMC), organised by the Research Group on Natural Compting (RGNC), appears on the Spanish journal El País. Click here for a link to the original news. 05-02-2008. The Sixth Brainstorming Week on Membrane Computing (6BWMC), organised by the Research Group on Natural Compting (RGNC), appears on the Virtual Center for the Divulgation of Mathematics (DivulgaMat), an institution of the Royal Spanish Society for Mathematics (RSME). Click here for a link to the original news. 27-08-2007. Francisco José Romero-Campero is interviewed on Andalucía Investiga. Click here for a link to the original news. 02-11-2006. Mario J Pérez-Jiménez has a profile on ABC de Sevilla . Click here for the original news. 04-10-2005. The Fourth International Conference on Unconventional Computation (UC'05), organised by the Research Group on Natural Compting (RGNC) and the Centre for Discrete Mathematics and Theoretical Computer Science (University of Auckland, New Zealand) , appears on the spanish newspaper ABC. Click here for a link to the original news. 23-08-2002. 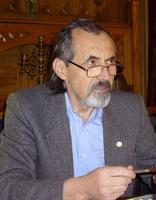 Mario J. Pérez-Jiménez participates in the Third Workshop on Membrane Computing in 2002, held in Curtea de Arges (Romania). The event is covered by the Romanian journal Arges Expres. Click the following links to see the original page: here (page 1), here (page 2).